Sid Phillips - Dealer For YOU! Sid Phillips founded Number One Auto in 1995 and is the owner and President. Sid grew up on the floors and in the warehouse of Shannon Hardware in Buckhannon. His father Bill owned and ran the business and put Sid to work at a young age, teaching him old-fashioned customer service, a strong work ethic, and values of integrity, all of which he has since passed on to his son, Shea. To Sid, his customer will always be Number One, and he will do anything in his power to make them the happiest customers in the world. When he's not at work, he enjoys spending time with his family, especially his two granddaughters, fishing, traveling, and watching college football and basketball! Shea Phillips - Dealer for YOU! Shea Phillips is one of our owners, but he also serves as one of our two Solutions Experts! Shea has grown up around Number One Auto since the beginning in 1995. He joined his father's business in 2006 after graduating from Marshall University. Shea has had a lot of unique opportunities in his life. In 2006, Shea was selected to be Matthew McConaughey's stand-in during the Huntington filming of the major motion picture "We Are Mashall". He spent countless hours working alongside McConaughey and got to know him pretty well! He was also an extra in several scenes of the movie. When Shea's not at work, he enjoys spending time with his wife Keri and their twin daugthers Winnie and Lucy. If you're looking for a better vehicle, be sure to see Shea for any questions you might have! He will be glad to help YOU! At Number One Auto, we don't have salespeople.... we have Solutions Experts. There is a huge difference between the two! Our specifically-trained Solutions Experts aren't pushy and aren't annoying... they are friendly, laid back experts that have only one goal in mind: helping YOU! Interested in a vehicle but not sure if you're ready to buy? That's ok here! Our Solutions Experts are available to help you with any questions you may have, as well as any free advice you may need! Jeff Higgins is from Elkins, WV and has been with Number One Auto since 2014. 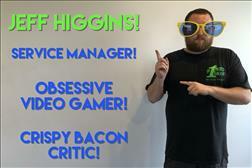 We are proud to annouce that he is our new Service Manager! Jeff is one of the nicest guys you will ever meet, and he is here to help you with any of your vehicle's mechanical or maintenance needs! If you need to schedule a service appointment, just call 304-472-1101 and ask to speak to Jeff! He will make sure that you are a top priority and that your needs are met in a timely manner! When Jeff isn't at work, he loves to go kayaking, play video games, and spend time with his Dad. CJ Lane - Solutions Expert! CJ Lane is one of our two Solutions Experts! CJ has a fancinating background! He spent several years in the railroad industry, so he knows a lot about trains! He's also the lead singer and guitarist in a regional band! He enjoys traveling around West Virginia, Ohio, and Pennsylvania playing concerts at many different, unique venues! He is super friendly and helpful. If you're interested in a better vehicle, CJ will be more than happy to help you in any way that he can! C.J. Boso - Finance Expert! CJ Boso is the newest member of the Number One Auto Family! Since we have two CJ's now, we simply refer to this one as BOSO! Before joining our family, Boso spent the last five years teaching math at Buckhannon Upshur High School, so he's definitely a numbers guy! He is in charge of overseeing our Number One Credit Approval Process, so he works extremely hard with banks and lenders to not only get you approved, but to get you the best approval possible! He also has a lot of great options to help protect the life of your vehicle! Boso has only one goal in mind: Helping YOU! Joe Howard joined our family in the summer of 2017! Joe is extremely knowledgable and hard working! 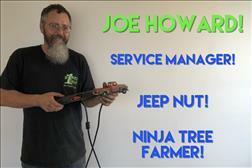 When Joe isn't at work, he enjoys spending time with his family, as well as hunting, fishing, and Jeeping! If you're a member of our family of customers and you need your vehicle maintained or repaired, call Joe for an appointment! He is here to help YOU while saving YOU money! Ernie Smith joined the Number One Auto family in the spring of 2018!  Ernie is very hard-working and knowledgable and extremely friendly! He is in charge of servicing and inspecting all inventory and preparing them for our customers to test drive and purchase! When Ernie isn't at work, you can find him one of two places: with his family, or on his Harley! Tammy Harris - Ambassador of FUN! Tammy Harris is our Ambassador of FUN! She is the friendly face you see when you walk through the doors of Number One Auto, as well as the friendly voice you hear when you call us! She has one goal in mind: helping YOU! Whether you need a Solutions Expert, to schedule a service appointment, or have a title question, Tammy will direct you where you can get your answers FAST! Give us a call anytime at 304-472-1101 and say hi to Tammy! 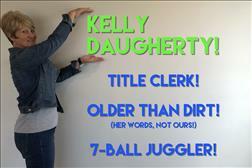 Kelly Daugherty is our "oldest" employee! By that, we mean she's been here the longest, since 1996! Kelly handles all of our titlework processing and a variety of other paperwork. She's the backbone of what we do! If you have a title, registration, GAP insurance, or paperwork question, Kelly is who you want to talk to! She is here to help YOU! When Kelly is not at work, she enjoys spending time with her family and being involved in her church! If you come in on a Monday, Wednesday, or Friday, be sure to say hello to Kelly!